Hoo boy. The governor of Virginia has gotten himself into a bit of a sticky wicket, hasn’t he? Ralph Northam’s medical school yearbook was uncovered recently showing him wearing blackface and standing next to a Ku Klux Klan figure. I personally believe that this little “detail” was always sitting inside his closet-of-anxieties. It’s probably been a ticking time bomb; one that I suspect he knew was going to eventually be unearthed at some point. Who doesn’t know what’s on their yearbook page, especially an elected official? Yearbooks aren’t meant to be like the ancient Egyptian pyramids, glorifying a life but also designed to be sealed-up so that no one will enter and learn about its contents. 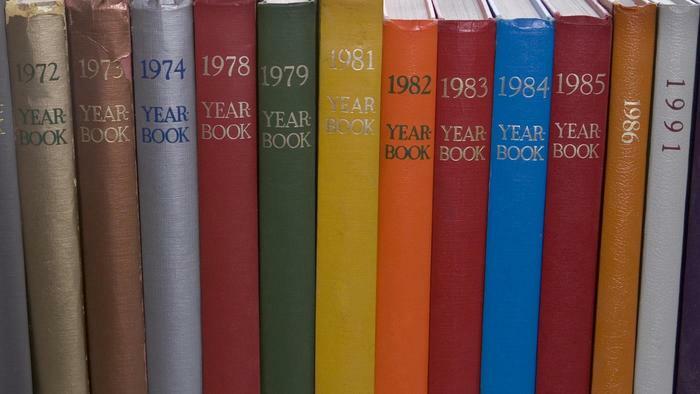 Nope, yearbooks sit on a shelf and are opened every ten years or so when a memory creeps back into one’s head by either a friendly reminiscence or a personal curiosity. They are a permanent history found in homes and libraries. You can’t run from a yearbook. They are also a pre-Internet cautionary tale to be careful about what is published about yourself since it can follow you for the rest of your life. The governor at first apologized for his picture. Then 24 hours later he denied that the black-faced man on his yearbook page is even him. He does admit to wearing shoe polish and dressing for a dance competition in the mid-eighties to look like Michael Jackson, though. Yeah, that fixes everything. It almost makes me forget about the KKK figure on the same page. But I can’t help the governor here. He’s in a mess of his own making, albeit 35 years after the fact. Besides, I’ve got my own troubles. I just took my own college yearbook off the shelf. 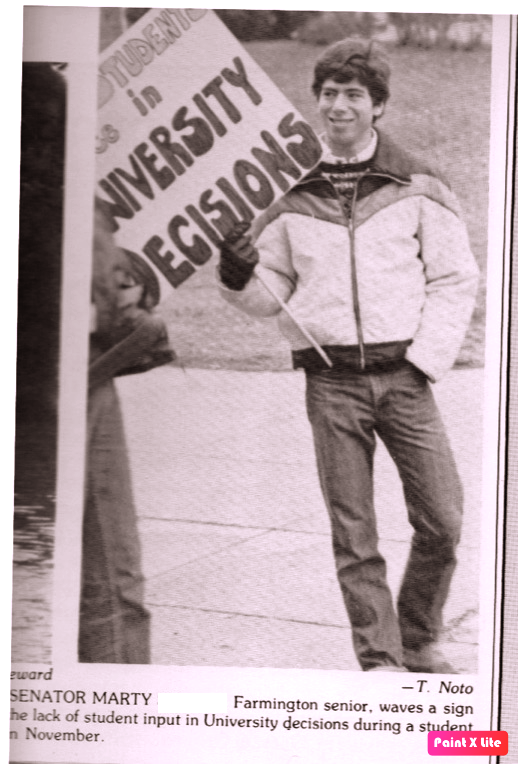 The above is your humble blogger in 1981 during a campus protest at my college, Eastern Michigan University. I was an elected member of the student government. We were protesting the school’s decision to sign the football coach to another year’s contract, despite the fact that the team had been winless in its recently completed season. Unlike the good governor, I actually remember the moment this picture was taken. I recall that it was an unseasonably cold November day, and when I looked into my jacket pockets to pull out my gloves, I found only one. I was really mad at myself for having only a single glove. 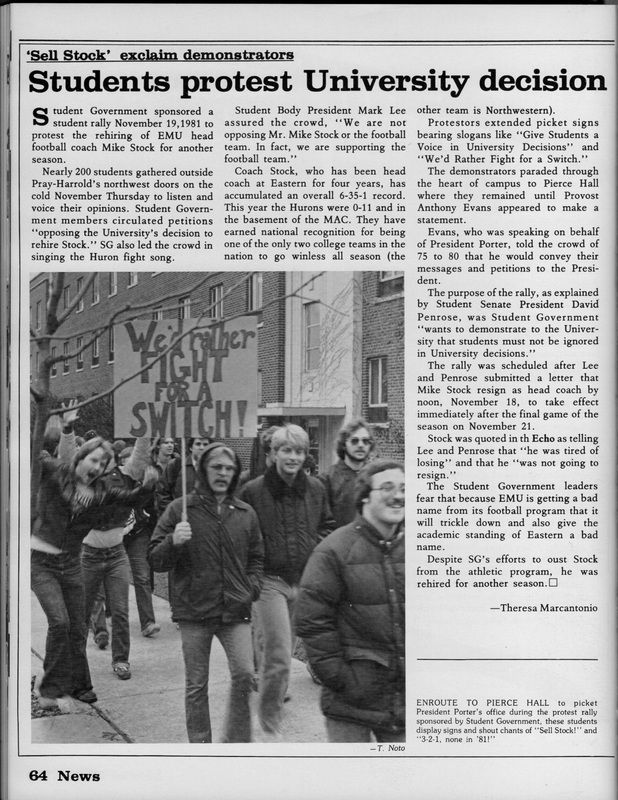 I proceeded to march with my fellow student activists along with one hand firmly in my jeans pocket. This was two years before Michael Jackson made wearing just one glove chic. I could have been a trendsetter. Instead I was merely looking for warmth. I feared frostbite; in November. We were a spirited group. We professed to be humiliated that our school was one of only two colleges in the nation with a winless record. Prior to the coach’s contract extension, the president and vice president of the student body visited his office and pointedly asked him to resign. The student newspaper was tipped off ahead of time, and promptly sent a photographer to stand outside of the office to snap a picture of the coach and the student leaders after the meeting. This incident created division on campus. Some felt the stunt was self-serving; that student government representatives were unnecessarily shaming this man in public. University administrators concluded that they weren’t going to be bullied by students, so they offered a contract extension to the coach. We responded by marching in protest. After the march, many of us went to an off-campus bar to have beers and cheer our success. We felt that we successfully created awareness and helped to foster a sense of activism at a higher education institution not generally known for campus involvement. My memory is crystal clear of that moment in the bar because I remember as we whooped and hollered in boisterous celebration, there was an even larger contingent of students (men and women, as I recall) whose attentions were riveted to the big-screen TV of the daily airing of General Hospital. “Shhhh!,” they hissed at us with glares to match. We had encroached on their mid-day turf, and our cachet, such as it was, paled compared to that of Luke and Laura. Never mind your activism, just let us watch our soap! Eventually the incident faded and we turned to other matters, specifically our studies and graduation for the following year. Most of us were fair weather football fans at best anyway. I remember nearly all of the details of these events. Whenever I’ve pulled out that yearbook over the years, I’ve grimaced as I looked at the pictures, wondering just for a moment how the football coach must have felt that day about what were doing and how we treated him. He deserved better. 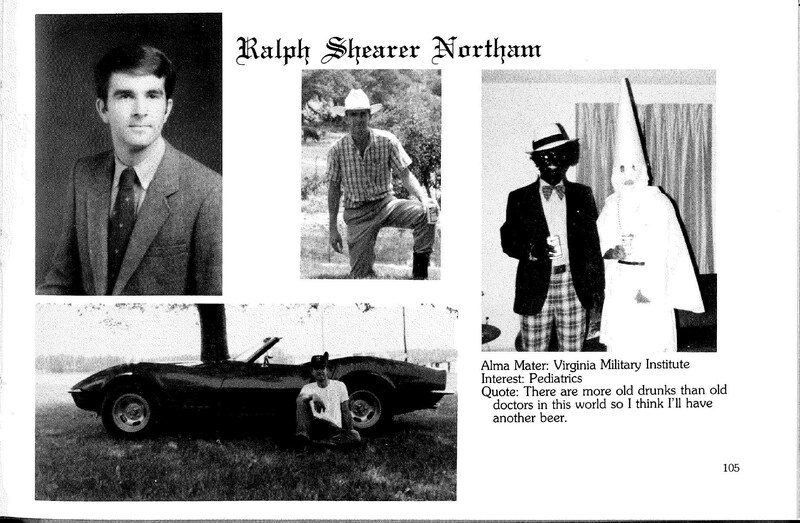 So as I read about the current events in Virginia, I bet Governor Northam has a pretty good recollection about the pictures in his yearbook too. Perhaps someday he’ll come clean about them. Sadly we all have things in our past we’d prefer to never surface. Everything also gets scrutinized by today’s standards. I’m amazed that there are any politicians in Virginia! Agreed, Kate. Some worse than others, I guess. But the question that keeps burning in my mind is: how did this type of photo (which seems to be surfacing as quite common in Southern University Yearbook Archives) get approved by the Editorial Committee? Plus, this isn’t exactly a High School yearbook or even a ‘normal’ College yearbook in that the University itself specialized in educating the future **medical Doctors** of America. At the risk of sounding greatly prejudiced against the South (at the very least a damn Yankee) – I’ll just add: And this was in 1984! Was the South truly so ‘backwards’ in their thinking? The KKK for goodness’ sake!!!! Okay, a road to ‘redemption’ should be a possibility for all – as in claiming a ‘changed life/view’. To that end I suggest at the the barest minimum: just admit it – offense/bad judgement whatever you want to call it – show remorse and a record of public service that reflects that change and take it to the public for a vote. Enjoyed your protest photo…Michael Jackson, eat your heart out! I like to think you’re onto something with the date there, Laura. By 1984 we were all pretty educated to the images and legacy of rampant racism. And, yes, certainly a medical school full of educated people one would like to think could sustain a higher display of tolerance. But it apparently young Dr. Northam took additional time to rid himself of it. I do agree that there can and should be a road to redemption, but I also think the voters deserve the opportunity to weigh in on that too. Perhaps the governor will eventually get to that place. Some years back a rather clumsy attorney professed to being the quarterback on his high school football team. I didn’t buy it, nor did my husband or his colleagues. I went straight to the source: his yearbook. And no, he wasn’t on the team. Today, it’s much easier to expose frauds with the Internet. Back in the day, it took a little detective work. Either way, people should be careful about yearbooks. They do come back to haunt you. Yep, they really were the precursor to the Internet in some respects. I suppose they can still cause problems for young people if they’re not careful. I smiled all the way through this post, Marty. Why with your yearbook photo, images of you intently marching with just one glove, Luke and Laura….you gave lots to smile about. And in the process, you made your point loud and clear. I couldn’t agree more! Hi, Donna. It’s not an easy topic in which to make fun or highlight in any light way, but if I poke at myself it’s easier to make a point. Glad you liked it! Excellent post. If Northam had alerted voters to the presence of his page pre-election and told them he had grown and changed in the years following his yearbook’s publishing do you think he might be forgiven? This whole thing about “It wasn’t me,” or “I’m not sure which one I was,” just made it worse. Of course he remembers the details. Virginia is not currently for lovers, it seems. Thanks, Moisy! Well…. we all make questionable judgements and do things we later wish we hadn’t. But not all of later decide to run for elected office either. If your friend from the 80’s ever decides to be a politician, he can use this blog to get all of that out in the open. 🙂 Thanks for reading! As Kate said, we all have skeletons hidden in our proverbial closets hoping they never see the light of day. This is a topic that my husband and I endlessly debate – judging an ‘accepted’ practice in the past through the lens of current sensibilities. Indeed those are tough debates you’re both having, Joanne. Really, for me it comes down not so much to the earlier behavior sometimes, but how you reflect on it now. Being candid and showing frank honesty is a good place to start at least. Marty, This made me recall the phrase “It’ll go on your permanent record.” Didn’t anyone else worry about that except me? Although I was such a nerdy introvert, I don’t think there are any photos of me in my yearbooks except the posed senior head shots. No misspent youth to account for. Nowadays with everyone posting everything, especially younger folks having fun, I wonder who’s future is already being squashed. You did a nice job framing this latest political outrage. Not to excuse the Governor’s actions at all, but I’m not sure many of us could withstand the scrutiny of our pasts that seems to be the norm today. What I find interesting is the clutching of pearls for some past actions and the total disregard for others (depending, of course of which side you are on). I don’t think he handled it well, but I hope he can survive it. I’m much more interested in how a person has conducted themselves more recently. Now, with (mostly) young people posting all sorts of things publicly, it will either be a non-issue in the future, or just about no one could ever run for office or attain a high position in a company. I think my main frustration with him is a lack of candor. How could he NOT have been aware of this on his yearbook? I’m all for admitting youthful discretions and showing later maturity, but I think it has to start with an honest and sincere accountability. Perhaps he will still do that. I saw that a group of African-American clergy from the state spoke on his behalf the other day. It is so funny that you were shushed by a bunch of soap opera fanatics, Marty. Yearbooks can be so incriminating. I used to run away when I would see our yearbook photographer coming. Now, I wish I had stood up like you, put on one glove, and posed for the camera. Like several of your readers, I had a really great time reading this post. It is fun to look back at our 20 something-year-old self – like you, I remember exactly what was going on when my college yearbook photo was taken. Sorry, no protest picture, but I give you a great deal of credit for standing out there for your principles. 🙃 oh my gosh, I forgotten about Luke and Laura and all that drama. I have a hard time with the idea of redemption for this Virginia governor and excusing what he did in his yearbook. In 1984 I think we all knew better. If we cared. My guess is that you and I and most of your followers did care, and we still do. Yep, totally with you on that, Pam. Why is it that mere mortals remember their life better than politicians? Hmmm.